Samanta S., Sankaranarayanan V., Sethupathi, K.
Dielectric response of the magnetic perovskite oxide Eu2FeCoO6. Haripriya G. R., Pradheesh R., Sethupathi K., Sankaranarayanan V.
Haripriya G. R., Debamitra Chakraborty, Pradheesh R., V. Sankaranarayanan, K. Sethupathi. T. Chatterji, B. Frick, M. Zamponi, M. Appel, H. S. Nair, R. Pradheesh, G. R. Haripriya, V. Sankaranarayanan, K. Sethupathi. Magnetic glass state and magnetoresistance in SrLaFeCoO6 double perovskite. 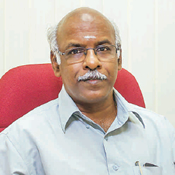 Pradheesh R, Harikrishnan S Nair, Haripriya G. R., Anatoliy Senyshyn, Tapan Chatterji, Sankaranarayanan V, Sethupathi K.
Haripriya G R, Pradheesh R, Singh M N, Sinha A K, Sethupathi K., Sankaranarayanan V.
Haripriya G R, Nair H S, Pradheesh R, Rayaprol S, Siruguri V, Singh D, Venkatesh R, Ganesan V, Sethupathi K, Sankaranarayanan V.
The Effect of Particle Size on the Magnetic Properties of Y2FeCoO6. Proc. of the Intl. Conf. on Nanotechnology for Better Living. Pradeesh .R , Harikrishnan. S .Nair, Sankaranarayanan. V, Sethupathi. K.
Giant Magnetoresistance and table-like magnetocaloric effect in double perovskite oxide PrSrMnCoO6. Influence of grain size on magnetocaloric effect in the nanocrystalline La0.8Te0.2MnO3. Functionalized Graphene-PVDF Foam Composites for EMI Shielding. Eswaraiah, V., Sankaranarayanan. V and Ramaprabhu, S.
Inorganic nanotubes reinforced polyvinylidene fluoride composites as lowcost electromagnetic interference shielding materials. Eswaraiah, V., Sankaranarayanan. V. and Ramaprabhu, S.
Colossal magnetoresistance in double perovskite oxide La2CoMnO6. Coexistence of giant magnetoresistance and large magnetocaloric effect near room temperature in La0.7Te0.3MnO3. Electrical study and dielectric relaxation behavior in nano-crystalline Ce0.85Gd0.15O2- δ material at intermediate temperatures. Ashok Kumar Baral and Sankaranarayanan,V. Srinivas, G. Ellerby, M., Skipper, N.T., Ramaprabhu, S. and Sankaranarayanan, V.
Large magnetic entropy change in nanocrystalline Pr0.7Sr0.3MnO3. Competing magnetic interactions in the intermetallic compound Ho2Mn3Si5. Magnetic Transport and Magnetocaloric Properties of Double perovskiteoxide LaCaMnCoO6. Dielectric Relaxation Properties of Nanostructured Ce0.8Gd0.1Pr0.1O2-δ Material at Intermediate Temperatures. Ion transport and dielectric relaxation studies in nano-crystalline Ce0.8Ho0.2O2-δ material. Optical switching properties of RCo2-type alloy hydride based solid state device. Influence of hydrogen absorption and desorption on structural properties of Dy1-xMmxCo2 alloys. Structural and hydriding-dehydriding properties of Ho1-xTixCo2 alloys. Hydrogen-induced and A-site substitution dependent structural properties of AB2–type (Ho1-xAx)Co2–Hydrogen system (A = Mm and Ti). Thermodynamic and kinetic properties of Ho1-xTixCo2–hydrogen system. Magnetic properties of Ho1-xMmxCo2 (x = 0, 0.1, 0.2, 0.3 and 0.4) alloys and their hydrides. Diffusion of hydrogen in cubic Laves phase Ho1-xMmxCo2 (x = 0, 0.2 and 0.4) alloys. Thermodynamic and hydrogen-induced structural properties of Ho1-xMmxCo2-hydrides. Temperature and concentration dependent electrical resistivity of Ho1-xTixCo2-hydrogen system. Magnetic and magnetotransport properties of Ce doped nanocrystalline LaMnO3. Magnetic and magnetoresistivity properties of nanocrystalline Nd0.7Sr0.3MnO3. Effect of Ar annealing on the magnetic and transport properties of Pr0.7Sr0.3MnO3. Journal of Applied Physics, 99,08Q315-1 to 08Q315_1-3 (2006). Journal of Applied Physics, 99,08Q310-1 to 08Q310_1-3 (2006). Journal of Applied Physics, 97,10H713-1 to 10H713-3 (2005). Journal of Applied Physics, 97,10M314 (2005). Journal of Magnetisnm and Magnetic Materials 292, 468-475 (2005). Physical Review B 70, 224424-1 to 224424-5 (2004). European Physics Journal B 38, 553-557 (2004). J Journal of Applied Physics. 95, 7528-7530 (2004). Journal of Applied Physics, 95, 7079-7081 (2004).